This is going to be pretty photo-heavy (especially for one of my posts), so I apologise in advance! This really doesn't do justice to the true eye-poppingness of the colours. 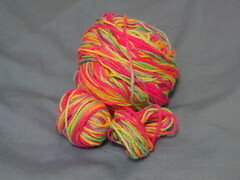 The first thing we both knew about this yarn was how much it cheered up a dull Spring day - it makes you smile just to use it. But it had its problems. 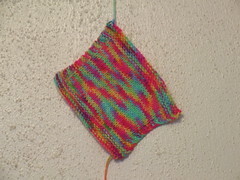 Like a lot of commercial yarns, the rigidly repeating colour changes make the colours tend to pool and stripe, even on a small swatch like this (about 4 inches square, on 4mm needles). The problem is, how to interrupt these sequences so that the effect is more mottled - and how to tone down the colours. If you compare this with the stocking stitch swatch, you'll see that the colours, while still being grouped together to some extent, are starting to look a little less regimented and more random. This was odd, because I expected it to interrupt the colour changes altogether - instead of which, they ran round the entire pattern. 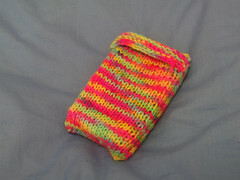 And so, I should have realised, they were bound to do - it's a single piece of knitting, after all! This had a very interesting outcome, much more the kind of thing I was looking for. 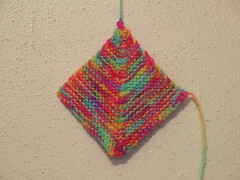 For an excellent tutorial on mitre squares, see Planet Shoup. Finally I tried a technique I found in The Knitting Answer Book (which I cannot recommend too highly. I only wish I were on commission). 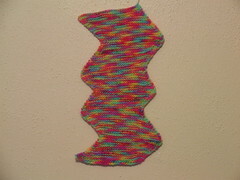 It's called helical knitting, or spiral knitting, because - you guessed it! - it's made in a spiral. Of course, all knitting worked in the round is a spiral, which is why we get the problem of the colour jog, but this technique actually capitalises on that instead of trying to fight against it. 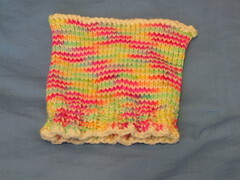 You begin by casting on however many stitches you need, onto a circular needle or dpns. DO NOT join the round. Turn the work, attach the second yarn to the needle (you will now have two cast-on ends of yarn at the same end of the needle) and purl back in your second colour. 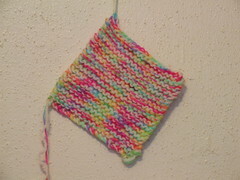 You now have one row of each colour, with the working yarns both hanging at the same end. Pick up your first yarn and, without twisting the two yarns together, join the round and begin knitting. At the end of the round, swap to your second colour. Carry on till you're bored, work a 1x1 rib (still working alternate rounds in each colour), cast off, seam the top and you're holding a baby hat with no colour jogs. Honestly. It's like magic, do try it yourself. For the same reason as on the iPod cosy, the colours still tend to follow each other round the hat - but, for the same reasons as on the garter stitch square, they're also diluted by the cream and don't seem so strong anyway. Spot the crack, on the left! The base screws off, you put the ball in, thread the end through the top, and screw the base back on. It's brilliant for stopping yarn rolling around, but you can't always see when you're nearing the end of a ball. Well, this has been a bit of a marathon. It's taken me most of two days to put this together, so don't expect another post too soon :) Off to have a rest and a nice cup of tea. 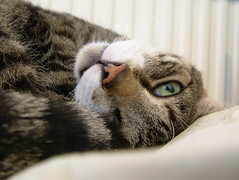 Tigger says, "Does that mean I get biscuits?" Thank you very much for the the pictures and explanation! All those techniques, must have been really exciting to see the effects they produce. Great ideas, keep 'em coming! That was a good write-up and interesting to see all the swatches and techniques. The baby hat design is brilliant. Just discovered your blog and luv it!!! Please keep up the good work, allowing for illness, chocolate cravings and Tigger attacks of course. 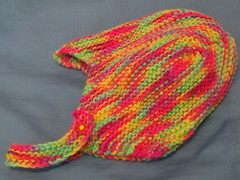 And that baby hat is so cool! That spiral knitting thing is genius. Thanks!